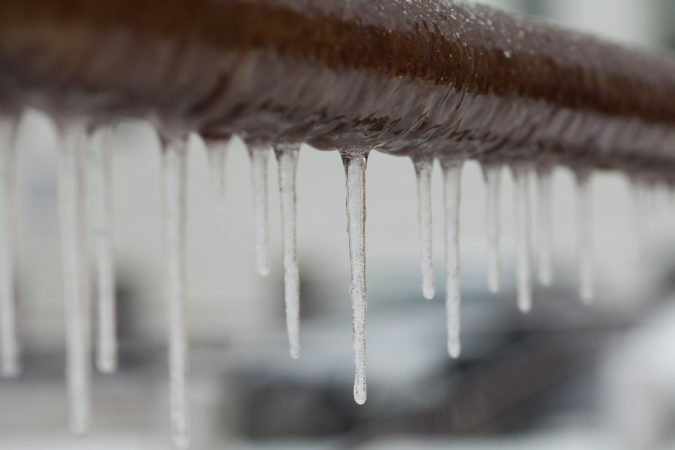 Earlier we discussed how to keep your pipes from freezing, but sometimes pipes freeze despite preventative measures. It’s vital to quickly get the water flowing through the pipe again—otherwise, the pipe will burst and damage your facility. Here’s how to thaw a frozen pipe in a quick, efficient, and safe manner. Time is of the essence. Get a licensed plumber to your facility ASAP, but plumbers may be hard to come by in the wake of a cold snap or storm. If you can’t get someone to your facility in the next few hours, you’ll have to go to phase 2: DIY. Once you’ve identified that you have a frozen pipe, you need to locate where the problem lies. Look for frosted areas or even bulging pipes. Hopefully these are in areas that can be easily reached. Turn on both the hot and cold taps to relieve pressure in the pipe. Begin thawing at the faucet and work your way back to the blockage. This will allow melting ice and steam to escape through the open faucet. If you start thawing closer to the blockage, melting ice can get stuck behind the blockage, which will create more pressure in the pipe and increase the likelihood of bursting. Hair Dryer: It’s unlikely you have a hair dryer at your facility, but this is a good reason to stock one, just in case. It’s an easy way to apply heat to specific points on the pipe: you simply turn it on and point at the pipe. Again, begin close to the faucet and avoid coming into contact with water when operating the device. Heat Lamp or Portable Space Heater: Position the device so that the heat is able to reach the frozen pipe. Electrical Heating Tape: Apply directly to the pipe. Hot Towels: Soak towels in hot water and wrap them around the pipe. This isn’t a particularly quick method, but it will help thaw the pipe. Turn up the heat: Simply turning up the thermostat can be enough to thaw the pipe. It’s not the fastest method, but it’s the easiest. Infrared Lamp: If you know where in the wall the blockage is located, place an infrared lamp in front of the wall at the location. Cut Out a Section of the Wall: This method is the worst case scenario, but if the other methods aren’t working this will allow you access to the pipe so you can do one of the four methods mentioned above. Be sure to continue to apply the heat until the water escaping from the faucet returns to full strength. Never use an open flame. This can damage your pipe, or start a fire in your facility. If a pipe does burst, immediately shut off the water to prevent further damage. If you can use a shut-off valve located near the problem area. Otherwise, shut off the main water line to the facility. For more help on keeping your facility safe—and warm—this winter, contact Vanguard Resources.